I can't sleep Friday night/Saturday morning, so I decide to make Upstairs a St. Patrick's Day card. 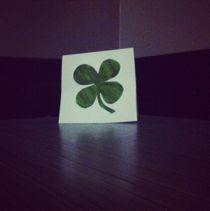 I cut and color a shamrock and tape it to a piece of folded paper inscribed with a limerick. I sign it XO, a lucky girl, and leave it outside his door. Chaucer and I go for a walk in the rain. He chases a ball on the lawn near City Hall, lumbering and sliding around on the wet grass like a puppy. 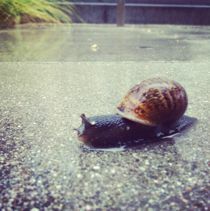 On the way back, he stops short to nose at something on the sidewalk - a tiny snail. When we get home, I finally feel sleepy, so I set my alarm for 1pm and crash for a quick nap. Upstairs texts while I sleep: Not going to Casey's. I'm gonna be looking around town for a mysterious cardgiver. W. comes over, armed with mixers for the bottle of Ketel in my freezer and a tiny plastic baggie printed with the Batman logo. Inside it are some small pink tablets: more of the ecstasy we'd taken a few days earlier. We stop by a neighbor's apartment, where Chaucer is treated to a few sips of beer and his usual overdose of attention. We have drinks and socialize while I play text-tag with Upstairs, who's already gone down to the street party. Live music pours in through the open windows, and I'm anxious to go watch it. The sidewalk is packed with revelers. W. and I enter the cordoned-off area through a separate entrance for VIPs and residents of my building - a concession to the inconvenience of our block being ground zero. We listen to music, mingle, and drink some more. By the time we run into Upstairs, maybe half an hour later, the drugs and alcohol in my system have kicked in. 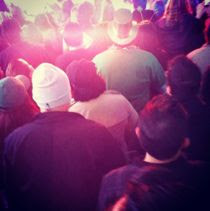 I catch his eye above the crowd; he's seen us first and is already grinning. The three of us spend the rest of the afternoon and most of the evening together, with breaks to hang out with other friends, walk our dogs, run up to my apartment for refills, and hit the bathroom in Casey's. When the U2 tribute band comes on, we wedge our way close to the stage to dance and sing along. Upstairs leaves to find his cousin, and W. looks at me. "He's competing with me." I don't understand. "Because he knows I'm here," he explains, pointing at my chest. "And he wants to be there." Upstairs comes back, and wraps his arms around my waist while all three of us bellow out the words to Sunday Bloody Sunday. He smiles and laughs every time I spin around to face him. He's rolling with us. I throw my arms around his neck, and he speaks low and soft in my ear: "You're my best friend." I can hear the words perfectly, in spite of the music, and I draw back to look at his face. His eyes are serious but shining. He pulls me back to him, and presses his face close to mine. "You really are." When I pull away to take some pictures and video. I hear snippets of conversation behind me, about me. "...anyone I ever dated would have to get her, so..."
The drugs, the booze, the music, and the joy of being with them both are almost too much: I'm euphoric. I grab W.'s scarf and look at him intently. "You taught me to love myself again. Do you know that?" He smiles and shakes his head. "It's true," I insist. I'm choked up, trying not to get overwhelmed by my emotions. "Well that just makes me sad, in a way," he says, "because you should never have stopped." Later, we all go to a party on the top floor of my building. W. and I grab a bag of Doritos from the kitchen and explore the penthouse while Upstairs socializes. The host downloads a Dandy Warhols song I want to hear, and we talk about concerts we've seen. I tell Upstairs I want to show W. his apartment and paintings, and he hands me his keys. The two of us walk over alone, and W. looks at Upstairs's work for the first time. I have a curious, warm feeling while he does so: pride. W. wants to go out, but though Upstairs and I try to rally, we're both too tired. We say goodnight to W., who picks up his pup from the play date he's been having at my place with Chaucer. Upstairs and I go back to his apartment to cuddle and watch a movie. I sit in his lap while we scroll through the titles on his computer. "Let's watch something sappy," I say, nuzzling against him. We settle on Wall-E, which we watch on his couch, spooning until our eyes grow heavy. Eventually, he carries me to his bed and I doze off with my head on his arm.